TN-IPC reaches out to anyone with an interest in the problem of invasive exotic plants, their identification, impacts, and control. We are committed to furthering awareness and promoting education on all issues related to invasive non-native plants. Contributors to and beneficiaries of TN-IPC’s work include professional land managers, private landowners, individual homeowners, public and private recreation areas, educational institutions, conservation and gardening organizations, and government agencies. Join us by making a donation. Show your support for a healthy natural environment with our cool t-shirt, a flattering, goes-with-anything cream. The colorful design shows Tennessee locked in a fierce battle with Japanese Honeysuckle! Sizes are small, medium, large, and extra large for $18.00, which includes shipping! Choose a size below and click “Buy Now.” Price is $15, plus $3 shipping. Thank you! The Board of Directors holds quarterly meetings to conduct the business of the Council, manages the assets of the Council, represents TN-IPC to SE-EPPC, serves as a liaison between public, private, and government entities, and develops educational resources for interested parties. TN-IPC officers are Kitty McCracken, president, Belinda Ferro, vice president, Christine Bertz, treasurer, and Margie Hunter, secretary. David Adams, Mike Berkley, Andrea Bishop, Adam Datillo, Jimmy Groton, Kristine Johnson, Katy Kilbourne, Chris Oswalt, and Pat Parr serve on the board. Information and bios for each are listed on the Contact page. Past board members include Claude Bailey, Jim Bean, Brian Bowen, Dan Brown, Richard Clements, Kevin Fitch, Nancy Fraley, Jack Gilpin, Terri Hogan, Sara Kuebbing, David Lincicome, Carrie Miller, Alix Pfennigwerth, Jack Ranney, Marie Tackett, and LinnAnn Welch. The Board of Directors meets quarterly in various locations across the state. Meetings begin at 10:00 a.m. and end no later than 3:00 p.m. The most recent meeting minutes also contain a full copy of the Treasurer’s Report. The Board of Directors revised the Council’s bylaws on June 8, 2011. The Tennessee Exotic Pest Plant Council was established March 12, 1994 in Nashville at the first annual Tennessee Exotic Pest Plant Symposium with assistance and support from similar organizations in California and Florida. A steering committee drafted the bylaws, served as the first board of directors, and successfully obtained 501(c)(3) non-profit status from the IRS. A year earlier an exploratory meeting of forty invited participants representing a cross section of resource managers, scientists, teachers, and others interested in the issue set the stage for this statewide organization. 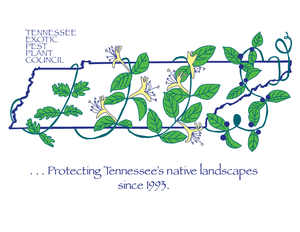 In 2016, TN-EPPC changed its name to the Tennessee Invasive Plant Council (TN-IPC), following the lead of other councils around the country. Since its organization, TN-IPC has hosted statewide annual symposia, and representatives of TN-IPC have given presentations at similar conferences. In the spring of 1997 the annual symposium was much wider in scope and addressed exotic pest issues throughout the region. The “Exotic Pests of the Eastern Forests Conference,” which was held in Nashville, was co-hosted with the USDA Forest Service and numerous other co-sponsors. One of TN-IPC’s primary tasks is the development of the invasive plant list in Tennessee. This list is updated regularly following a rigorous evaluation protocol utilizing input from numerous botanists, ecologists, and resource managers across the state. TN-IPC publishes several educational brochures and has held numerous workshops on invasive plant identification and control. In cooperation with Great Smoky Mountains National Park, the organization published the Tennessee Exotic Pest Vegetation Manual in 1997. TN-IPC serves as a technical advisory body and participates in cooperative efforts to get federal and state government agencies out of the business of using exotics. TN-IPC is a member of the National Association of Invasive Plant Councils and a state chapter of Southeastern Exotic Pest Plant Council. While much remains to be done, the Tennessee Invasive Plant Council fills an important role addressing a critical issue that no other organization in the state recognizes as its mission..